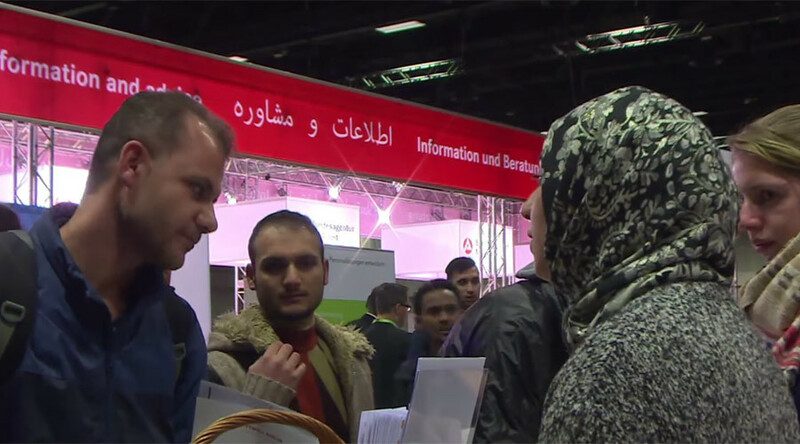 More than 4,000 people attended a refugee-only job fair in Berlin hoping to gain employment with one of the 211 employers exhibiting at the one-day event. The public and private sectors collaborated to organize the event with jobs in a variety of fields on offer, including tourism, IT, construction, medicine, and supermarket chains. The turnout was greater than the organizers had expected and Christian Henkes, spokesperson for Germany's Federal Employment Agency, told Al Jazeera that there is a “huge willingness” among these people to find a job. Fadi Salem, a teacher and refugee from Syria, told Ruptly that as a teacher he hopes to secure work in education, but without changes to Germany’s language requirements, he will have trouble finding a job. Henkes said there is also a “big interest” among employers to “give these people a chance in the country”, which was reaffirmed by Ekkehard Streletzki, the owner of the Estrel Hotel where the event was being held. Such sentiments were also echoed by hotel owner Stephan Kuehne, who told AFP that due to a shortage of young people in Germany they had a number of positions to fill. The question of the refugee status of potential employees was secondary, Kuehne explained, as long as they had the right qualifications and were motivated. Around 1.1 million asylum seekers entered Germany in 2015, although 130,000 migrants who officially entered Germany in 2015 never turned up at the accommodation provided for them. Frans Timmerman, vice president of the European Commission, said in January that over half of those traveling to Europe were from countries “where you can assume they have no reason whatsoever to ask for refugee status” and they were seeking better economic prospects.